Boundaries. The boundaries of the parish of Sneinton are complicated. It must suffice to indicate that commencing south of Messrs. Turney's Works, near the north-east of Trent Bridge, proceeding eastwardly, crossing the Trent lower down in order to enclose the "Hook," re-crossing at the west end of the Colwick trees, and mounting the hill to the tops of Colwick Wood, Sneinton Dale, Carlton Hill and Thorneywood Lane, to near the Asylum grounds, descending to St. Ann's Well railway bridge, again ascending by the top of the Corporation gardens, and passing Bartholomew Stile, down Gordon Road to Southwell Road, thence turning southerly by the Beck, now in a culvert a short distance west of Manvers Street, excluding St. Philip's Church, and so we return across the Railways, and by the old course of the Leen to the Trent. Sneinton was in the Hundred of Thurgarton, and was severed from the County and annexed to the Borough of Nottingham in 1877. Geology. The westerly part of the parish is on the Bunter Sandstone, and over this on the easterly and northerly sides are the Keuper Marls. This is well exposed on the west of the Suburban Railway bridge over Colwick Road, where the coarse sand rock Bunter Pebble Beds are overlaid by about fifteen feet of other Bunter Pebble beds, and fourteen feet of red and grey marl. (See Memoirs of the Geological Survey, 1908, page 37). The best exposures of the Waterstones are between Sneinton and Colwick on the Railway side, and also on the Suburban Railway. Underneath the Bunter Sandstone the coal measures are to be found, and as coal is now at Clifton Colliery 795 feet from the surface, and the dip is eastward, so that at Gedling the High Hazels is found at a depth of 1112 feet, and Top Hard 1378 feet, an estimate may be formed of the depths under Sneinton. The Trent valley vast ages ago was much higher than it now is, and was washed away, but the great hill of Colwick withstood the torrential force, and the stream ploughed up and carried away the ground of the valley to a depth of some twenty feet below what the surface now is, then came a mighty stream from another direction, and instead of eroding the valley deposited millions on millions of small portions of rocks torn from somewhere, and rolled them smooth, and we call them gravel, and these with sand cover a depth of three to fifteen feet. Then followed an alluvial deposit four or five feet in thickness containing a large quantity of vegetable matter, and in some places it is peat. Another change came, and the alluvial has several feet of red deposit—hardly clay or loam—so that the Borough Engineer states when very wet weather comes the ground rises two inches, and falls when it it is very dry, thus causing a difficulty to a builder's foundations. Was Notintone the same as Sneinton? In almost identical terms a paragraph appears under the head "In Snotingeham " (Nottingham) but with the additional words "There is nothing in demesne," and Notintone is inserted as almost a forgotten item between the accounts of Kneeton and Meering. Further, a Jury in 1287 said that "Sneynton was never called Notinton, but alwaies Sneynton, and that Notinton was a part of Notingham on that side towards Arnehall." See the question fully discussed in "Notts, and Derbyshire Notes and Queries," 1894 and 1896, where it will be seen that during the five hundred years between 1086 and 1599, when Sneinton became the settled way of spelling the name, there passed ten different forms of spelling, but it nearly always retained its "i," or "y" instead. In "The Place Names of Notts., their Origin and Development," a forthcoming book, Dr. Mutschmann says that Sneinton is derived from "Snotinga, tun, "the homestead of the Snotings." The same family that settled at Nottingham (q. v) seems to have founded a village here." Notintone" represents the Norman pronunciation with the initial S dropped as in Nottingham." In "A Contribution to the Study of Anglo-Norman Influence on English Place Names," by R. E. Zachrisson, we are told that the Anglo-Norman N has been substituted for Sn in Nottingham, but in Sneinton, O. E. Snotingatun, the Anglo-Normans forms have not prevailed. "At the time of the Norman Conquest S before l, m, n had already been dropped, or changed into another sound * * * * * * consequently the combinations Sl, Sm, Sn in English place names were unknown to the Normans, and had to be altered." In "Domesday Survey," Mr. Stenton says that "in view of the undoubted fact * * * that in documents of the time the name appears as Snotintone, or Snadinton, we shall not be disposed to attach much weight to the verdict of the Jury of 1287." The Fields. From the Domesday report we may assume that the cultivated land at that time in Sneinton was (?) 240 acres, the land tax being paid on half only, possibly because one-half was each alternate year lying fallow, for when there were no cultivated grasses or turnips to feed cattle through the winter indoors there would be little manure, and therefore the land must rest. Once in three years was, however, usual, and it may be more was cultivated than was taxed. Further, as the land was the King's land—a royal manor—and we are told there was "in demesne nothing," that is, the King had there no chief manor place, house, or land in occupation, the eleven villeins, or subject tenants, had not the duty of cultivating the royal manor farm, but each of them cultivated his share of the land, and had one acre of a joint meadow, and possibly one tenant had a double share. The land was cultivated in strips, called by farmers to this day "a land," with a balk, or unploughed furrow, between them, and the ploughing was done by six or eight oxen belonging to different owners, each finding two, and working in combined cultivation. Dr. Mutschmann says the general sense of Oxincroft is "cattle enclosure," Tatildale "the valley belonging to, or inhabited by Tatil," and Brery-hill "the hill where thorns or briars abound." The Manor. It will not be of general interest to follow the history of the Manor. A few items must suffice. In the fifteenth year of King Henry II. (1169) the King's daughter was married, and the Sheriff accounted for five marks (= £83 6s. 8d. now) which he had received from the men of Snotington. (Yeatman, p. 22). Few villages are recorded as paying. Was Sneinton more loyal than they, or better off? The Manor having been granted to John, when Earl of Morton, before he became king, he, in 1204, granted his manor of Snodigton, and many other manors, to be held in fee farm (fixed rental) of £8 per year, and the service of Peter de Sandiacre, to William Briwerre, and in 1218 granted Snotinton to William's son Richard. William Briwerre was a baron and judge and one of the Regents of Richard I., and was made Sheriff of Notts, and Derbyshire, and many other counties, acquired great possessions, was one of John's evil advisers, upholding the King notwithstanding both had signed Magna Charta. He died 1226, having assumed the habit of a monk. (See Diary of National Biography). Whatever faults John had, and they were many and great, he seems to have been a good landlord in Sneinton, and eighty years afterwards the men of Sneinton sighed bitterly for their position when John was their landlord. "Robert de Pierrepont," says Mr. Rogers in his "Sherwood Forest," "who was of French extraction, came first into England at the time of the Conquest. In the thirteenth century Sir Henry de Pierrepont married Annora, only daughter of Michael de Alanvers, and sister and heiress to Lionel de Manvers, by whom he became possessed of several lordships in Nottinghamshire, and among them that of Holme, which now retains the name of Holme Pierrepont." In 1285, Henry de Purpunt and Annora his wife, who were the lords of Sneynton, were sued by a number of tenants of the manor, which was an ancient demesne of the King's Crown, to shew cause why they contrary to the King's precept exacted other services and customs of the said tenants than they were wont to perform when the manor was in the hands of King John. Then the tenants held a bovate (? 15 acres) for 4s. per annum, and attendance at the Manor Court every three weeks, but now 13s. instead of 4s. was demanded, and in various ways specified they had interfered with their rights and privileges, and further they had taxed the said men one hundred marks, and had taken their cattle in Sneynton, and drove them to Holme. The defence was that the men were not upon the King's ancient demesne but were their villeins, and so subject to servile tenure. The case was adjourned for Domesday book to he searched, and Notintone was found to be the King's land, but when the case came on again, as before named, the Jury said "Sneynton was never called Notinton, but alwaies Sneynton, and that Notinton was a part of Notingham, on that side towards Arnehall," (Arnold). This, Thoroton says, "surely is the most evidently false of anything that ever pretended to be called a verdict," but it was one that served to get the tenants fined, and finally to submit. The tax of 100 marks, Mr. E. C. F. Dolley suggests, and I concur, was probably a figurative expression for a large sum—not literally 100 times 13s. 4d. In 1435 there was an Inquisition held in Nottingham, on a pending lawsuit, in which the Jury found that Patricius de Chaworth was the owner of the manor of Sneynton. Tenure. An illustration of the manner of holding land is given in a report of an Inquisition taken at Nottingham in 1835, on the death of Robert Pirpount, who had a tenant at Sneynton named John Tibbetoft, whose rent appears to have been 26s. 3d., and the land was held by the said Robert for the term of his life by the service of one pair of gloves, or one penny by the year for all service. Other land elsewhere is mentioned in the same Inquisition as being held by the said Robert "by the service of one pair of gilded spurs," or " one clove of garlic," etc. (White's Dukeries, p. 205). Thomas Page at his death in 1516 held four acres of meadow in Snaynton of Sir William Pierpoint, knight, as of his manor of Snaynton by fealty: and the Jury said the worth yearly beside reprises (expenses) was 18s. 4d., that is 8s. 4d. per acre. An Old Inclosure. King Henry VIII. appointed a Commission consisting of the Bishop of Coventry and Lichfield, and others, to ascertain among various matters what lands in tillage had been turned to pasture and inclosed. They held a session "at the Borough of Nottingham on Monday the Vigil of the Nativity of the Blessed Mary (1518), and had fourteen "Jurors within the wapen-take of Thurgaston," who agreed that William Perpoynt, knight, had in his demesne as of fee ten acres of arable land, and eight acres of common meadow in Snaynton which on the 4th July, 1514, he inclosed "with hedges and ditches, and them so inclosed turned to pasture of animals." It appears by the rental that the lord of the manor was owner in fee of the common land. 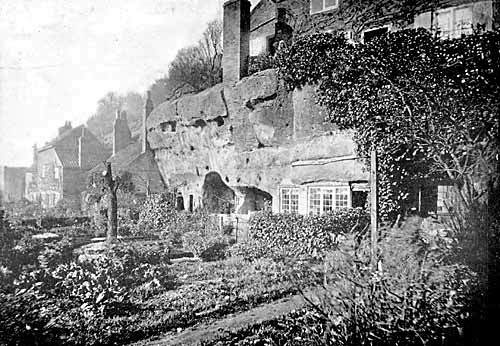 The complaint of the King that in some places houses had been pulled down, and large parks made for the pasturage of wild beasts, did not apply to Sneinton. (See Thoroton Society Record, Series II., page 13). The Borough Records. We will refer to a few items recorded. It may be we shall learn something. 1396. Roger Doket in Seyntmarigate slapped Emmota Bishop, of Sneinton, in the face, and the Mayor fined him 6d. (Present value ?10s.) At the "Penalty School" Roger would learn how to behave, but he was a very doubtful fellow, for he raised an axe against Roger de Sneinton. 1467. The Mayor had a dispute with Henre Perpoynt, Esquier, "for the rearying of a milne, dryvyng of stakes, making of hegges, and dammes with erth, and other thinges in the Water of Leene adioynyng vnto the seide towne of Notyngham opon that oon' side and the Lordship of Snaynton opon the other," etc. The dispute was referred to arbitration. 1438. The pynder (Pindar) of Snenton is mentioned. The pinfold until recently stood near the west end of Colwick Road. 1484. John Chaloner, and Emma his wife, about 1484, gave and assigned five acres of meadow in Sneinton, for the sustentation of the works of the Bridges of Hethbeth—or Trent Bridges. This land was let to William Conington for 15s. a year rent. There were many legacies and gifts by other persons for the repair of the bridge The Chamberlain records that he attended at the Court Leet of the Manor of Snaynton, and paid 2d. to be enrolled on the Court books in respect of the meadow. (Multiply ten or twelve times for present value). Leading gravel then cost 1s. per day, but for two carts carrying gravel to the causeway against Snaynton ford only 10d each was paid. Labourers were paid 4d. a day, and a lock for Snaynton Wood Gate cost 4d. 1541. Rychard Jepson and Robert Leym were, in 1541, paid for six days work of dykying and quicksetting of the Long Hedge Lane (that being the Nottingham boundary) 2s. 1579. The Mickletorn Jury in 1579 presented: "Wee presente the cawse (causeway) a gaynste Snenton Forth (Ford) to be graveled, for when waters be owt, hit is so deepe worne that hitt dothe ovarthrow packe horses." 1611. A printed writ of Privy Seal from King James I., addressed to William Trynder of Sneynton, requiring him to lend £6 18s. 4d., shews how illegal exactions would bring bitterness and ultimately vengeance. Page 404. 1624. "The cartway betwixt Snenton Feld and Barkar Gatte" was out of repair, and was ordered to be amended. 1684. Foreigners, that is, people who were not burgesses in Nottingham, were not allowed to lead manure out of the town unless they paid the Chamberlain a penny for every cart-load led over the stones, and it was ordered "yat Snenton Burg men shall fetch noe mucke oute of this Towne vnless they doe yearely amend the highway att the Tyle house lane before Midsomer day."